Note From RVing Al: This was originally submitted on our Ask An RV Question Page. As you will find out when you read the story we also thought it should be added to our Funny RVing And Camping Stories Page. Bill was nice enough to give us permission to post it here. Please enjoy. We just bought a new (new to us) fifth wheel trailer 3 weeks ago. The day we bought it, the guy that was selling it to us, walked me through all of the stuff I should know, like, how to hook up to electricity, water, etc. He also talked us through how to dump the holding tanks. We could not actually dump the tanks because we were at his house and there was no sewer to hook up too. I did take notes on everything he told us to do. This past weekend me, my wife and our two boys took our trailer on our first camping trip. It was only for the weekend so we went to a campground that was 70 miles from us. Everything went well until we were preparing to leave. My wife reminded me that we needed to dump the tanks. So I went to my notes and hooked up the sewer hose to the trailer and put the other end into sewer hole at our campsite. I was sure that I hooked everything up right (at least I thought I did). I pulled both of the levers in the sewer compartment. When I pulled the levers I heard a big gushing sound as the sewer hose disconnected from the RV. I was standing right in front of it when the hose came off. the trailer. I tried to grab the valves and turn them off, but I slipped and fell down in all the muck. My wife and kids heard all of the commotion and came out of the trailer to see what happened. Instead of helping me, they just stood there staring at me. Then one of my sons started laughing at me, then my wife and other son joined in. I said something to them that I can't write here. I finally got the valves closed and some other campers that had seen what happened to me came over to help me clean up the mess I had made. They also sprayed me with water to clean me up the best they could. My wife and kids refused to help. My family would not let me in the trailer until I took a shower and changed at the campground restrooms. I have taken three showers since this happened and I still cannot get the smell off. I can tell you that I am not a happy camper right now, I don't want to go through this again. Sorry for the length of this, but I hope other people can learn from whatever mistakes I made. That is why I only put my first name here, I am too embarrassed to give my full name. 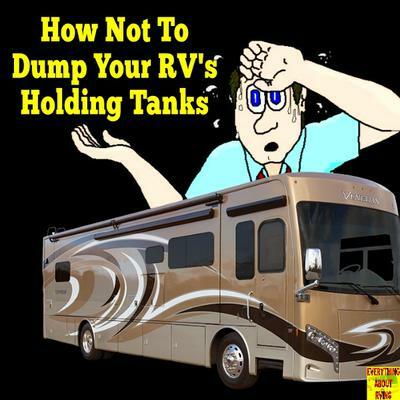 Note from RVing Al: The video below walks you through the proper way to dump your RV's holding tanks. Do you have any comments on this story? You can add them to this page by clicking on the "Click Here To Post Comments" link located near the bottom of this page. The maiden voyage of the TITANIC 2 . This is a great page for anyone: especially new comers. The :" What extras you need'? Is right in! Get a clear elbow (pictured above), pay extra for the hose backflush inlet. Use a regular hose but use a "Y" connector (AT LEAST one drinking water reinforced hose, two would be better : I your absolutely sure which is which. Obviously the same length or longer.) Hook up your "city/hire " water thru your pressure regulator, inline filter, 90° elbow or flex stub hose into your unit. Then : "AS DAWNS EARLY DUMP!" bring out hose #2 the purple pink and red painted one)~ hook it up to the ,CLOSED "Y" Valve & ,CLEAR DUMP ELBOW, TURN​ ON THE "Y" : turn on the clear hose valve = TEST! Now back flush close and flush your toilet 123? DUMP AND BACK FLUSH. LIFT SEWER HOSE (GET ALL THAT, "PROTEIN" OUT OF THE ACCORDION HIDDEN CREVICES . DUMP AND RE-DUMP YOUR GREY. DONE! waiting: have no farm tools & torches. Hooch up a reverse cap (good hose sets or clear elbows come with caps) get one and flush with your #2 water hose, after disconnecting you primary white hose: super flush your sewer hose. Now your ready to remove the Nic gloves? Wash any :"exposed skin" and your good 2 go! First time 45 - hour , now 15-20 min to:. " Preparations to launch!". Perhaps you didn't read my post closely enough. You start by emptying your black tank first. In order for your grey tank to drain into your black tank, both valves have to be open; if your black tank is empty, there is only one direction for the water to flow; from the grey tank into the black. once you then close the grey tank valve, the black tank contents cannot flow back into the grey tank. Once you then empty the black tank, there is no possibility of contaminating your grey tank. We have talked to RV repair places and many RVer's, who all recommend this method. NEVER OPEN BOTH VALVES AT THE SAME TIME , that will contaminate the grey water side , and would have to be disinfected , after all they are in different tanks for a reason . Put LONG rubber gloves on , they should be kept beside the valves at all times . Open the black water valve first and let it drain , then close that valve , then open the grey water valve and that will clean out the hose , close that valve . Remove the hose from the valve connector only , then rinse the hose with clean water , make sure you keep your mouth shut the whole time , you know what I mean . 1. Open the black tank valve and switch on your macerator. Empty the black tank completely, then switch off the macerator. 2. Leaving your black tank valve open, open your grey tank valve and wait 30 seconds or so while the tanks equalize(the grey tank contents will flow into the black tanks until each tank has the same amount of liquid in it). 3. Close the grey tank valve. Switch on the macerator and empty the black tank completely. Switch off macerator, then close the black tank valve. 4. Open the grey tank valve, switch on macerator and empty the grey tank. 5. Switch off macerator and close grey tank valve. This sounds convoluted, but once you have done it a couple of times and understand the principle, it will become second nature. What you are doing is using the soapy water in your grey tank to help rinse your black tank and help keep the sensors clean. It works best if you have as much or more contents in the grey tank as you do in the black. Just before dumping, we often run a couple of sinkfulls of soapy water into the grey tank. Oh man, what a bummer. We've been RVing for 25+ years, and every time out is a learning experience. We learn what we need to repeat(in preparing to disconnect) and learn what we do NOT want to repeat -- as in your case. Don't be too hard on yourself. And when you're in an RV park, there are usually people around that could answer questions. I know I would help or give out advice in a heartbeat. Hang in there, my friend. c) pull the black tank valve first -usually the larger of the two (or three) valves than the other valves -they will be the grey water (from the shower usually and the sinks - this will have a cleaning affect at the point where the pipes meet and where the hose connects to - what happened to you is not anything to laugh about and can be dangerous if any gets in your eyes from a splash - also usually (not always) a dump station will have a water hose to clean your dump hose etc. with - even a seasoned tech can get into trouble if something breaks like the plastic hose flange (I have had it happen to me)- one thing you may want to look into is an rv macerator that attaches to your trailer dump pipe and macerates the material and discharges out a regular size water hose into a sewer - this takes a lot longer but is much safer - you can see it on www.campingworld.com and other RV stores - also get one of those plastic storage bins with a locking cover to put your hose, gloves etc. in - hope this helps! Sorry to laugh, but the first time we used our tanks we filled it with water just in case something terrible happened. We also held every connection, just in case! Sorry to hear about your misfortune - your wife and kids should permanently be The Dumpers from now on since they didn't help you! Did the campground charge you for the spill? Usually they'll charge since they have to do a cleaning of the entire area before another rver can come in. I NEVER walk anywhere near sewage holes for that very reason! YUCK!